You’ve arrived in the airport lounge, the balmy beaches on the French Riviera are now just a flight away. All is going smoothly until you look up at the Flight Board, it flashes ‘delayed’ ominously against your flight number. Sound familiar? Delays are not an uncommon nightmare for families travelling in peak season and can become a headache for parents with young children. Wendy Shand mum of three and founder of Tots To Travel – experts in baby and toddler-friendly villa holidays – shares her nine tried and tested tips to help families cope with airport delays. 1. After booking – Make sure you’ve given the airline your mobile numbers. Try downloading the airline’s app if they have one. That way, you will receive push notifications about delays and cancellations. 2. Think ahead – Pre-planning will make any delay less stressful. Make sure you’ve packed enough food and drink and entertainment. Download your kids’ favourite apps, games and videos before you leave home. 3. Knowledge is power – In the run up to your holiday it’s worth being aware of what’s going on in the news. Check the airline’s website or app regularly for further updates. 4. Keep calm – Once a delay becomes apparent, it is really important to stay calm. Children are sensitive to anxiety and may well begin to play up. A delay is outside of passengers’ control so acknowledge that there is nothing to be done about it, and stay light hearted. The whole family will have an easier time. 5. Entertainment – Depending on the children’s ages, have a good selection of activities prepared. Books, kids’ magazines, colouring books are great whilst a pack of cards is great for pairs, snap and a range of other games. It’s also worth having a balloon or two and a small ball for really long delays. 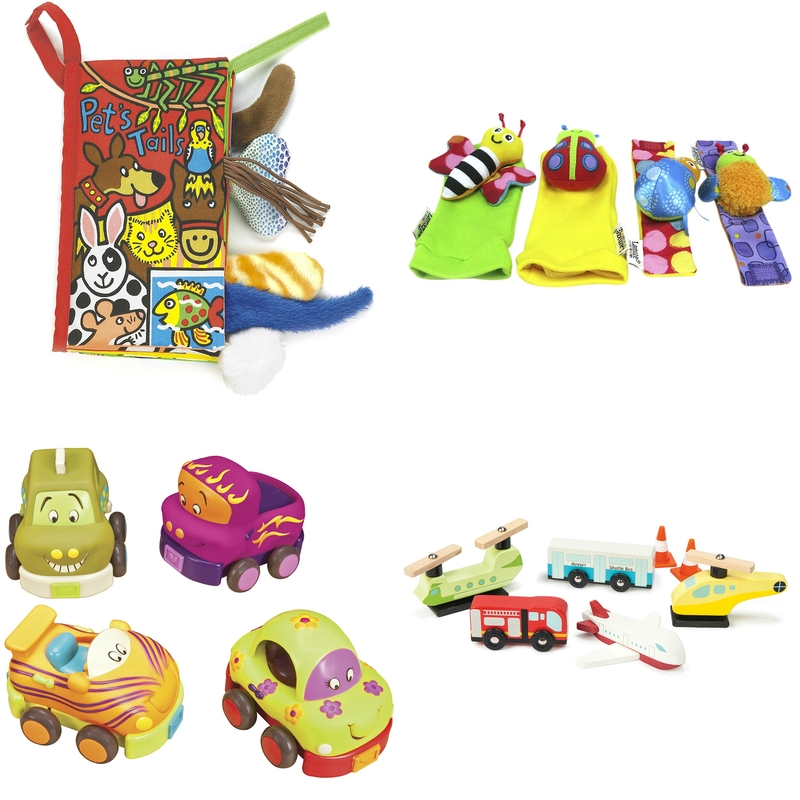 Some of my suggestions from the JoJo collection are Pet Tails Soft Book (perfect for keeping little ones amused), Sock and Wrist Rattle Set (will fit into your handbag and keep your baby entertained), Wheelies Toy Cars (pop one of these into your hand luggage) and Toy Airport Set (what better place to play with these fun and imaginative toys?). 6. What’s around? – It’s worth exploring theairport to find out what there is for children. Keep an eye out for play areas and good vantage points for watching the planes. 7. Food & drink – Pack plenty of food, snacks and drink in the hand luggage and hold some back to cater for a last minute delay. Fluid is not allowed through security, so ensure that everyone is kept well hydrated with water from one of the shops in the departure lounge. For babies and young children, think ahead to what meals will be needed if a short delay happens. If a longer delay happens you may need to be flexible about what you feed your baby. 8. Sleep – Try and keep babies and toddlers in their routine, perhaps by taking them for a stroll in their buggy. If possible, persuade toddlers to take their regular nap, and have a pashmina or scarf on hand to wrap them up if needed (even if you are travelling to a warm country, a jumper or scarf is useful for cold departure lounges). For more information about Tots To Travel, or to view any of the properties, visit www.totstotravel.co.ukor call the team of family travel experts on 0800 014 2770.